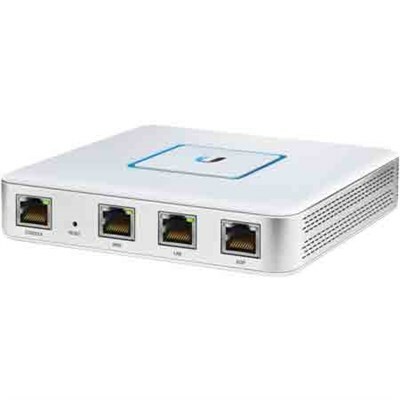 Ubiquiti Networks introduces the UniFi Security Gateway, which extends the UniFi Enterprise System to encompass routing and security for your network. The UniFi Security Gateway combines reliable security features with high-performance routing technology in a cost-effective unit. Two models are available. The USG features a wall-mountable form factor with a dual-core, 500 MHz processor for standard hardware-accelerated performance. Powerful Firewall Performance The UniFi Security Gateway offers advanced firewall policies to protect your network and its data. Convenient VLAN Support The UniFi Security Gateway can create virtual network segments for security and network traffic management. VPN Server for Secure Communications A site-to-site VPN secures and encrypts private data communications traveling over the Internet. QoS for Enterprise VoIP and Video Top QoS priority is assigned to voice and video traffic for clear calls and lag-free, video streaming. The UniFi Security Gateway is deployed in the same manner as UniFi Access Points for wireless networking. Use the intuitive UniFi Controller to conduct device detection, provisioning, and management.